lobber, originally uploaded by jahansell. 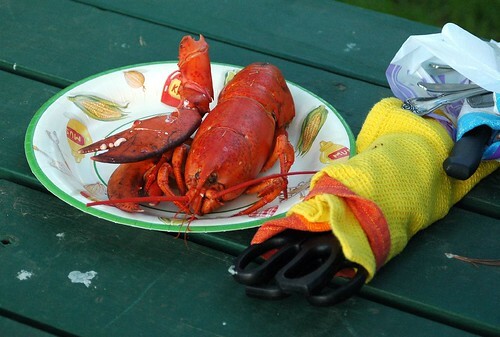 Not my dinner - I stole the photo, but not the lobster, from someone else's feast! Fabulous colourful photo. Lobster is so expensive here...is it a luxury meal where you are? Hum!!!! cela m'a l'air bon vous êtes courageuse d'avoir résisté, moi à votre place ......j'adore tout les plats en rapport avec la mer. Thanks Jenny for visiting my blog and for the tip about the concert! I will try to go, but have some friends around this weekend... If I (have to) miss this one, other concert proposals are always welcome! I now briefly visited also your blog and I will be back, with pleasure! It's a pity you could not taste the lobster, but it least you let us enjoy it on the photo! Cute description. I like lobster tail but don't really like getting the whole lobster. This is very much what I think of, when I think "New England!"